Max Weber and Karl Marx, the founders of modern sociology, underestimated the importance of the way people in power think, behave and persuade others of the supremacy of their values. Throughout most of history three groups, the soldier, the merchant and the sage, have struggled to gain predominance over a fourth group, the greater populous. When one of these groups achieves unchallenged control over the others the result has culminated in an imbalance of values leading to war, economic disaster or revolution. Interestingly, most societies are based on an informal alliance between two of these three groups. For example, early agrarian societies were often led by aristocrats with warrior and landowner values (soldiers) in close alliance with priests (sages), who provided a spiritual justification for their rule. The merchant was usually tolerated for bringing wealth through trade, but was also resented for being cleverer and often richer than traditional elites. During the 17th century, the merchant's power increased and decreased always dependent on protection from the soldier group. But it was not until the late 17th century that merchants first began to emerge as the dominant group in Europe. During the 19th century the rise of “soft" merchant values really took off. The British used their growing empire as a force for promoting free trade and globalisation in the so called interests of all. Nevertheless their competitors regarded these imperial projects as less benign. By the mid-19th century, the world of merchants was becoming one of competing business cartels, increasingly backed by the might of Nation States. But no country adopted the values of the “warrior-hard merchant” with more vigour than Bismarckian Germany, where repression at home and brutal zero-sum commercial competition with other rising industrial powers became the order of the day. The first world war was largely a consequence of the limits of allowing merchant values to become the dominant group of values. After the first world war, the US emerged as the wealthiest nation and dominant exporter of capital. This led to the spread of a new form of merchant power across much of the developed world in the form of debt-fuelled consumer capitalism. Yet the massive financial and trade imbalances that resulted again brought the dominance of merchant values to an end with the Depression in the early 1930s. The second world war ultimately inspired a new alliance of “sagely technocrats” and “soft merchants”. They were determined to learn the lessons of the past, this partnership worked to create a new world order of prosperity and social harmony. The early fruit of the combination of these values was the Bretton Woods monetary system, which established the rules governing commercial relations between the developed industrial nations. Interestingly, the collapse of the Bretton Woods System in 1971, heralded a new renaissance of the dominance of hard merchant values. This period was led by the Anglosphere and was characterised by the so-called Washington consensus and "Davos Man". It launched a renewed age of the dominance of merchant values without the sagely values to reign it in. This age still continues today. To understand the banking and sovereign-debt crisis that has taken hold since 2007/08, the Geo-Trade Blog believes the US and Europe are paying the price for succumbing to the values of merchants, who believe in the justice of the market, and prize the pursuit of short-term profit fuelled by credit and risk. But perhaps there is a much broader problem. Modern democratic governments in the US and Europe play a much larger role in the economy than any governments in the ancient Greek democracies could ever have imagined, therefore, this in turn makes political leaders a huge source of patronage, in the form of business contracts, social benefits, jobs and tax breaks. What are China's中国 values ? Perhaps a more interesting question in the 21st century is, which of these three groups, the soldier, the merchant and the sage will gain dominance in a China led world? China owes its re-emergence to its embrace of the contemporary US and European model of modernisation – to a large extent driven by hard merchant values that put the country on its current path more than three decades ago. But the question of values remains unanswered. It is interesting to note that Chinese traditional values are being replaced by what researchers have identified as an emphasis on material values - making money has become a major concern for most Chinese people. The new material values are expressed by a desire to buy apartments, cars and fashionable clothes. Showing external signs of wealth has become a basic social requirement. The Chinese do not play chess, a game with a rather adversarial objective to eliminate your opponent from the board. 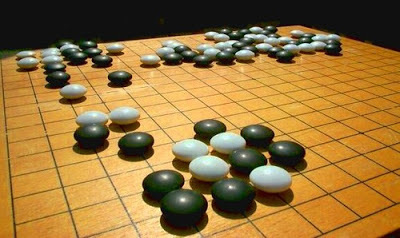 Instead the Chinese invented 围棋 where the object of the game is to encircle your opponent and gain control of a larger total area of the board (see above picture). To some extent, this provides an insight into the different ways of thinking in Europe and the US compared with China 中国. In traditional Chinese culture, righteousness, or justice are perceived to be an important value. If democracy can protect an individual's political rights, it would seem the Chinese are sceptical as to whether it can ensure that people use their power to do the right thing. In Chinese culture, the legality and morality of procedure as well as the result are both just as important. Here in lies the eternal challenge that all democracies are forced to grapple with - what if the laws and democratic processes do produce “immoral” results, for example, an extreme-right wing party is able to win power in democratic elections or what of wars fought by a country that are not supported by its citizens. In conclusion, it would seem that there is some commonality of horizon but the ways of thinking and framing problems remain different. It is still too soon to tell what combination of the Soldier, Sage and Merchant values will emerge in China 中国 as dominant but the Geo-Trade blog will continue to follow closely the new thinking on values emanating from China 中国 in the 21st Century.